Whether it is a single family home close to the slopes or condo / townhome living close to Boulder Lake and the Slopes there is something for everyone inside of the Beautiful Pocono Resort at Big Boulder. Conveniently located in quaint Lake Harmony, PA right off of PA Route 903 this Legendary Area of the Pocono Mountains offers to its homeowners use of the 175 Acre Big Boulder Lake and some awesome views of the Ski Slopes at night. There are 15 Ski Trails and 6 tubing chutes for winter fun! When Jack Frost opened in 1972, the experiences from Big Boulder laid the groundwork for a well thought out ski resort. All of the slopes, lifts, buildings, and snowmaking that would be required were planned as part of the original construction. Today, Jack Frost Ski Area is a companion resort to Big Boulder Ski Area. 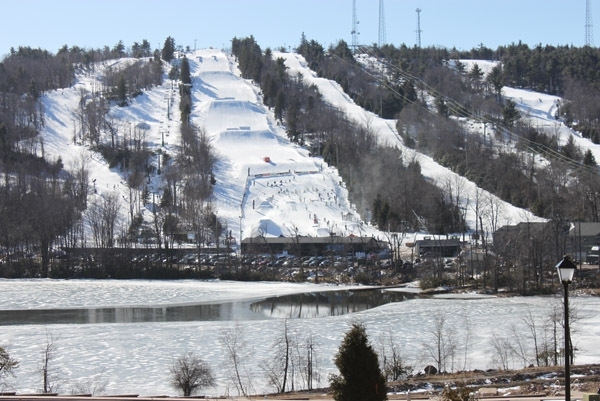 With roots in the industrial age these two Legendary Ski Resorts have become the Heart and Soul of the Pocono Mountains ski industry of Northeastern Pennsylvania. Big Boulder Ski Area is devoting 50% of its overall terrain to park features. The base elevation is 1700 feet with a summit elevation of 2175 feet and a vertical drop of 475 feet. Big Boulder boasts the most progressive and innovative Terrain Park Program. 15 Different Slopes to include: 4 Easiest (beginner slopes), 3 More Difficult (intermediate slopes), 3 Most Difficult (advanced slopes) and 5 Terrain Parks. There are 8 lifts:2 triples, 5 doubles and 1 ski carpet. Jack Frost Mountain provides an Inviting Ski Area with a Summit Elevation of 2000 feet, Base Elevation of 1400 feet and Vertical drop of 600 feet. 21 different slopes to include: Ski School Learning Slope, 4 Easiest (beginner slopes, 6 More Difficult (intermediate slopes), 8 Most Difficult (advanced slopes) and 2 Terrain Parks. There are 9 lifts: 1 quad, 2 triples, 6 doubles and 1 ski carpet (used for kids lessons only). The Wonderful, Family Fun, Friendly, Luxerious, and Legendary Pocono Resorts are what makes the Pocono Mountains Truly Special. Find Yourself a Beautiful Home right near the Slopes and enjoy a Day of Skiing, Snowboarding, Snow Tubing, and then find yourself at the Big Boulder Tavern or Nestled at your Home Near the Slopes around a Warm Cozy Fire.